Thanks to this week’s co-writer, the Dalai Lama. Edit: the special hell link. Not all believers hate atheists. Some just feel smugly superior. Keep up the good work. I love the way you can take an idea and express it in just four frames. Your output is always thought-provoking and illustrative of human frailty and idiosyncracy. ‘Dalai’ is particularly good. Well done. Firefly reference? 😉 The paedo priests will be sharing their Special Hell with people who talk in the theatre. I’m always amused at people holding up the Dalai Lama as some sort of role model…he was the leader of one of the most repressive theocratic regimes going, accountable to no one but his fellow Lamas and running a monk infested country that was backward even by the standards of most theocracies. I seem to recall reading that under the rule of the Dalai Lama and his crew ALL land in Tibet was owned by monks and the only function of the non religious population was to work to maintain the monks. I’m not saying the present situation in Tiibet is ideal by any stretch of the imagination, but those who are agitating for a ‘Free Tibet’ would do well to look at what the country was like when the monks and the Dali Lama ran it . Rant over. Like the cartoon by the way! I really liked this one. A special Hell for Pedo Priests, perhaps Ratty can reopen Limbo for them. The Dalai Lama seems to have a pass that the pope must envy. Doesn’t matter what he actually says, just get the photo-op. And a special place in hell for paedo-priests and their enablers? So, we don’t need to trouble ourselves about earthly justice, the system has it covered. Herm, what about people who drive at 45mph in single carraigeway 60 zones with miles of empty road in front of them and a huge tail of cars behind? IMO Hell is too good for them. I am not smug. Just superior. If it weren’t for the smugness, I’d be superior in every way. A special Hell for Pedo Priests… Hm. I just wonder: how do they know? The Torygraph has that Damian thingybob as one of their religion bloggers – he clearly has a direct line to the Satanic Throne. Not saying that China’s foot on Tibet’s neck is good, but it is better than the Lama Rama Ding Dongs keeping it stone age. 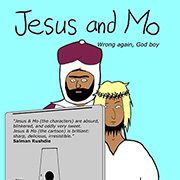 Off-topic a bit, but when I read J&M I imagine Jesus to have Owen Wilson’s voice, only more stoned, while Mo sounds in my head like Danny de Vito. In the above strip it works particularly well. We’ll see what happens next time. MrGronk, ooh, you’re gonna have a fatwa on you, using De Vito’s voice for Mo! Aren’t “a woman’s place is at home” and “death to the infidel” shared memes? Yeah, maybe so, but that’s only because we’re right and they’re just misguided idiots. @MrGronk — I think I love you. Jesus is clearly being played by Owen Wilson (new Jesus anyway) but I hadn’t realized who had the role of Mo. Of course it’s DeVito. I agree that Owen Wilson would be a great Jesus. Danny DeVito was cast in the role of Mo four years ago. @Danny DeVito was cast in the role of Mo four years ago. 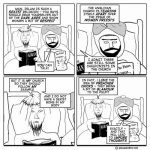 Abrahamic religions all have a ‘hot’ core of dogma. Dangerous as hell. It’s good to get that on the record! I strongly disagree and throw fatwas at will at the idea of an Owen Wilson or Olsen Twins playing Jeebus. If Josh ever existed instead of being a one man symbol of the Nazarene Jewish sect, he would be symbollized by a dark haired Semitic monk, not a Nordic blond! I believe it’s usually called, “Head of a Young Jew as Christ,” so I’d guess it has at least a chance of looking more like what some random Judaean might have looked like than the conventional Aryan model beloved of many Europeans and most Americans. “Random male Judaean,” of course. Apologies for the male privilege; I really do know better — but bad habits often die hard.